I’m fond of remembering the origins of artists’ careers. Their first shows often give a sense of who championed the work, and how it was defined by critics. In 1966, the Jewish Museum in New York presented the first show of Minimal art, titled Primary Structures. While citing most of the major figures in that new movement in modern sculpture (then called Minimal art or ABC art), curator Kynaston McShine included Larry Bell, one of the younger artists. Bell’s work was not unknown to the New York audience, as it had been shown by Sidney Janis Gallery in their 1964 exhibit Seven New Artists and a major one-man show at the prestigious Pace Gallery in 1965. In fact, Bell’s sculpture had already caught the attention of none other than minimalist Donald Judd, who cited Larry Bell in his 1965 essay Specific Objects for Arts Yearbook. 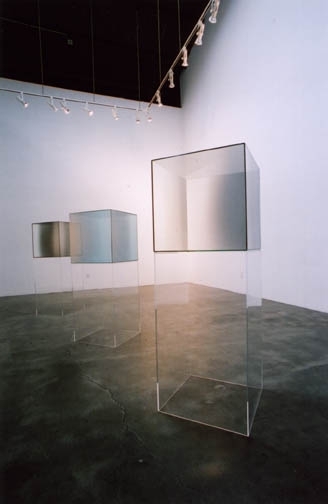 Indeed, Larry Bell’s early reductive, cool glass sculptures were exhibited and discussed in many major survey shows and publications. New York historian and critic Michael Benedikt contributed Sculpture as Architecture: New York Letter, 1966-7 to Art International, and that essay discusses the 1966 Whitney Annual. The author stated, “Box sculpture may well have reached a ne plus ultra with Joseph Cornell, represented by a Celestial Box of more than familiar star/goblet iconography. The recent work of Larry Bell (seen here in one of his icily elegant empty boxes, untitled) and perhaps that of Sol LeWitt (on view with one of his glassless, multi-compartmented boxes) are, I think, as close to Cornell as to the Primary Structure”. By the next year, 1967, New York historian and critic Irving Sandler spoke directly about Bell’s work, writing “The rectilinear scaffolds of Sol LeWitt and Larry Bell section and contain space, turning it into masses of air—negative solids—unlike the constructions of the 1950’s, which pierce and cut into space vigorously.” The Sandler essay appeared in the catalogue for American Sculpture of the Sixties at LACMA, and was included in Minimal Art: A Critical Anthology. Having helped the curator with the organization of the show, I’ll be very pleased to see Primary Atmospheres in early February. I’m just wondering how many visitors will recognize the connection to the show titled Primary Structures. First things first. Many of the small, early works currently on exhibit at the gallery show the artist’s interest in Asian ceramics. He was particularly fond of Imari ware and Kutani ceramics. Rare among American ceramists, his works were collected by museums in Asia, including the Shigaraki Museum of Contemporary Ceramic Art in Japan, and the National Museum of Modern Art in Kyoto. I’ve been remembering Ralph Bacerra as we prepare to present a show of early work tomorrow. I see some of his personal interests as we arrange the works. Ralph was an avid gardener who cultivated exotic orchids, a traveler, a man who loved his dogs, and he was a gourmet cook. Yet what is fascinating, as I look back, was his outlook on life. He had a singular vision—to be a ceramist. He told me about when he saw a stoneware vessel in high school, and learned about ceramics from Vivika Heino at Chouinard, and how he had an immediate affinity with ceramics. He was incredibly focused and directed from that time on. He became a leader in the movement of American studio ceramics, not just because of his generous talents, but also because of his vision and hard work in the studio. In his long career, Bacerra addressed everything from the small cup form to a huge 3,000-piece tile mural. In an interview for the Archives of American Art, I asked Ralph to describe the difficulties or opportunities presented by his largest public work, a commission. You may think that I am an art dealer, but actually…I became a student of Ralph’s. His questioning voice and his challenges were always there. When I stopped by his studio and brought his work to the gallery, he would tell me how it was made. When we traveled to San Francisco, he walked me through the collection of the DeYoung museum, and pointed out the prime examples of Asian Art. If my gallery showed new work, he came to test the ring of the pot, and pronounced it properly fired—or, not. I began to grasp the concepts of glaze “fit” and the order of firing. It wasn’t easy, but I guess I passed the tests. Because when Ralph took you on as a student, there was tremendous loyalty. He didn’t let go. He was a true supporter of the gallery, and never missed an opening…even the one three days before he died. I wish he could be here tomorrow.